If you click the "Start" button, you will successively see a number of words that are names of colors. Each word is written with letters in a certain color. Try to name as fast as possible (out loud) the color of the letters in which the shown word is written. This means that you should not read the words themselves! After each word, you will see a colored dot that shows the color that you should have said. Unfortunately, your browser does not support HTML5. Just do it. Do not cheat! Because of you did, this test would be no fun. We promise that there are no tricks to this test. The question: How many times do you see the letter F in the sentence above? Count them only once! Do not go back and count them again! Perform the calculation below as fast as you can, and using only mental arithmetic (so without pen and paper, or a calculator!). The question: What is the result of this calculation? The question: How many black dots can you find in the image? Note that the image is static (i.e. it is not changing); we are not fooling you! We offer you a unique optical illusion! First, make sure the yellow area is visible on your screen. When you have started the animation, you will see a rotating spiral. Stare at the center of the spiral until the animation stops. Then look immediately at the back of your hand, which is on the mouse! Press the "Start" button to start the animation. The question: What do you observe, when looking at your hand? 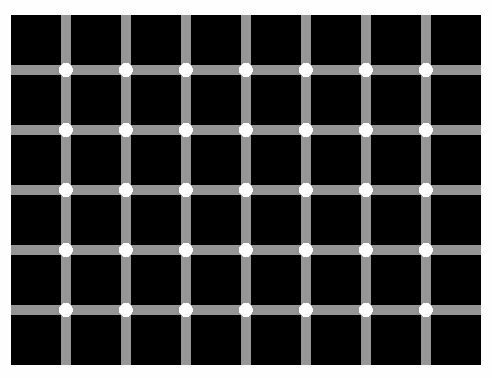 Look tightly at the black cross and wait for a few seconds. The question: What do you see? Sometimes, our brain sees things different than they are... See for yourself! The question: Is the center square of stars standing still or moving? Another question: Is the left center circle larger than the right center circle in the image below? Yet another question: Are the horizontal lines parallel, slanting, or curved in the image below? The question: What do you see in this image? Another question: What do you see in the image below? Yet another question: What do you see in the image below? The fourth question: What do you see in the image below? The fifth question: What do you see in the image below? How can we make the impossible possible? That is simple: by drawing it! The stairs are drawn in such a way, that they look like continuous ascending or descending stairs. Another question: How many legs does this elephant have? After downloading it, you can start the urinal game on your own PC. After downloading it, you can start the brain test on your own PC, and we ensure you that it is worth the effort!